The last few weeks, I have been enjoying quinoa in a totally different way. 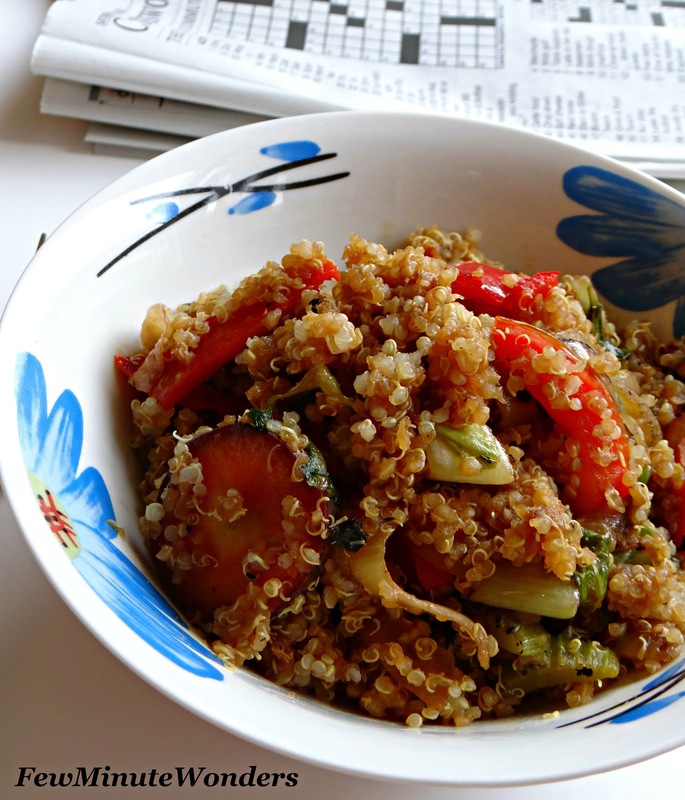 I substituted quinoa in the place of rice and made my favorite Indo - Chinese version of quinoa. Everyone knows that quinoa has a very nutty taste and smell. Lots of people do not like it very much just for that reason. But in this recipe, I was mildly surprised at the soy sauce, garlic flavors taking over the the nutty flavor. A very simple main dish to prepare when you have left over quinoa. I found that it works best when the quinoa is cold or not freshly prepared. It does not get too sticky and looks fluffy. With a bunch of veggies and some left over quinoa this one is a winner. My entry to Healthy Me and Healthy Us. 1. Heat the wok on high with the oil. Add onions, carrots, bell pepper and give it a toss and allow it get cook while stirring. 2. Add the cabbage, lettuce and cook until they get lightly wilted. 3. Add the ginger , garlic, soy sauce and chilli sauce and give it a mix. Absolutely love this simple recipe. Please do send it to my "Healthy Me & Healthy Us" event (read the rules). Such a nutritious and definitely a healthy twist to usual fried rice. First time landed here! I dont know how I missed your blog!! I adore your writing skill! Delicious quinoa, you make delicious dishes with quinoa.